Judah Folkman's passing this week was a sad event. I got to hear the great man speak -- at Millennium's spectacular internal seminar series 'Innovators in Medicine' -- and he was great -- inspiring, friendly, insightful. He will be missed. Folkman was well known for having enduring brutal ridicule around his angiogenesis hypothesis. In his talk, he mentioned that he kept a room at his lab wallpapered with the years of rejection notices for grant applications and journal submission, using it to remind his students and staff that such difficulties could be overcome. One of the obits even published the crack that angiogenic factors exist 'only in the mind of the principal investigator'. It was good to see the Globe reprint, although buried inside a section (the lead on the obituary did make the bottom of the front page) a wonderful portrait of Folkman. I don't know how long the article will remain free, but a smaller image shows up with the search. Folkman is shown framed by a lab bench with a face mixing weariness and thought. He did have quite a face! Not a movie star face, but one rich in features and details. It isn't easy to think of good scientific portraits. Most departmental shots are straight formal shots, if not near mugshots. A few sterotyped poses predominate: for example, googling on Folkman yields some standards: hand on chin thoughtful, looking up from a microscope, teaching in front of a blackboard, listening to a colleague. 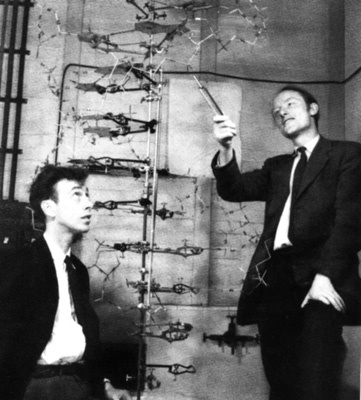 One classic is the shot of Watson & Crick with their model, though the photographer had Crick point with a slide rule, a tool utterly alien to the work. Any favorites out there? What are the best photos which illustrate the character and nature of a scientist? Well there are always the iconic ones, like Feynman's photo with his bongos, or Jane Goodall's hand-holding with chimps.